Age: Turning 39 in 11 days. Racial / Ethnic Identity: Indo-Guyanese American. Why do you want to write for Rescripted? : I want to help expand the range and volume of voices responding to American theatre. I want to help archive the work of theatre-makers of color. I believe that I am able to see, hear, and experience the intentions behind the work of QTPOC theatre-makers in a way that white, cishetero reviewers may not. When I write a review, I want to lift up the ways in which the piece may have achieved its intention and the ways in which it may not have. I also just want to geek out about and celebrate theatre: our collective mirror and opportunity for dialogue. What are your artistic disciplines? : Playwright, dramaturg, ceramic artist. What “lenses” do you bring with you when you go to a show? Prison abolitionist, immigrant, feminist, product of colonization, trauma-survivor, anti-capitalist, anti-racist, Gemini-Cancer cuspian, English major, Microbiology minor, Master of Science in Traditional Oriental Medicine, NERD. Who is your favorite theatre artist and why? I am torn between Kristiana Rae Colón and Isaac Gomez on this one. I have admired both of their work for a long time. They are both unapologetically political, intelligent, and fierce. They each approach social change in different and equally-valid ways. Kristiana builds the world on stage as it could and should be. Isaac paints the world as it is. I want to live in Kristiana’s worlds and struggle beside her characters. I always leave her plays with my own fires rekindled. Isaac’s worlds mirror and reveal my own terror and grief. I leave his plays feeling exposed, seen, and heard. They both inspire me to keep writing and struggling, so if it’s okay, I will call it a draw. …Actually, no. …If the world was ending in 2 hours and I can see either a play by Kristiana or one by Isaac, I’m going to Kristiana’s play. I want to die full of revolutionary fire. Bio: Tanuja Devi Jagernauth is a playwright and dramaturg who believes in the necessity of creation during times of destruction. Tanuja’s short play, SKIN, was recently part of the Our Perspective: Asian American Play Readings at the Goodman Theatre in Chicago and workshopped by The Pulp Stage in Portland, OR. 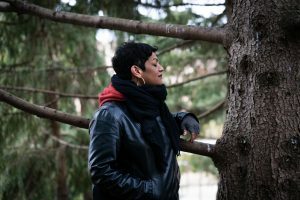 Tanuja is currently working as a dramaturg for Sideshow’s Freshness Initiative in collaboration with Brynne Frauenhoffer and Regina Victor. Recent dramaturgy credits include Stage Left’s production of Robert Schenkkan’s BUILDING THE WALL, Pegasus Theatre’s production of THE GREEN BOOK by Calvin A. Ramsey, and Cloudgate Theatre’s production of ANOTHER JUNGLE by Kristin Idaszak.